As homeowners, we know you want to get the best value for your hard earned money. Here at Factor Irrigation, we want to make sure you understand the difference between a good, well designed system and a bad, poorly designed/installed one. That's why we created this guide on what you should look for when looking at an lawn irrigation system. An example of a poorly installed sprinkler rotor. 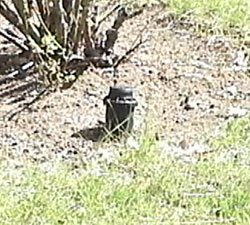 This one is mounted too high, protruding above ground level where it can be easily struck and broken. A properly installed sprinkler rotor. This is mounted flush to the ground, so when it is not operating, it descends to ground level, protected and ready. 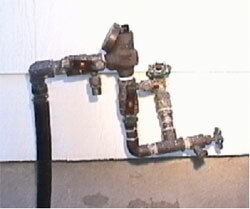 An example of a poorly installed valve box. 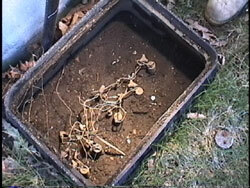 Here, the valves are buried in dirt, and the box is not flush with the ground. 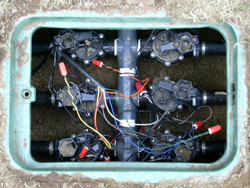 A example of a well designed valve box: wires are sealed, valves are positioned in the box so dirt does not cover them. When sprinkler heads are spaced too far apart, they do not water evenly. This will result in uneven growth and/or other lawn issues, such as some areas being overwatered, while others not receiving enough. At 30 feet, the sprinkers are now head to head. There are no weak spots. Result: even, effective watering of the lawn. 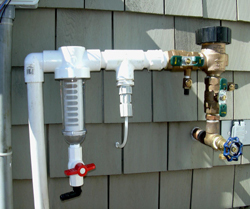 Residential sprinklers throw water approximately 25 to 40 feet. But with typical water pressure and volume demands when the system is running, average coverage is 30 feet. For more information, contact Factor Irrigation at (401) 828-1116 today! 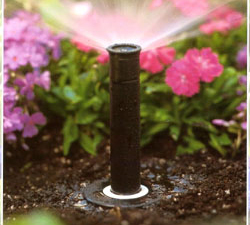 Factor Irrigation takes pride in the professional installations performed for both residential and commercial cleints. We use name brand, quality components from reputable suppliers such as Hunter, Watts, and Rainbird in our installations. We are fully licensed by the state of Rhode Island and offer yearly service agreements, and maintenance and repair services to back up our products. Experience the Factor Irrigation difference!